COLUMBIA, S.C. (AP) — Call it a tail-wagging ending to a doggone good story. 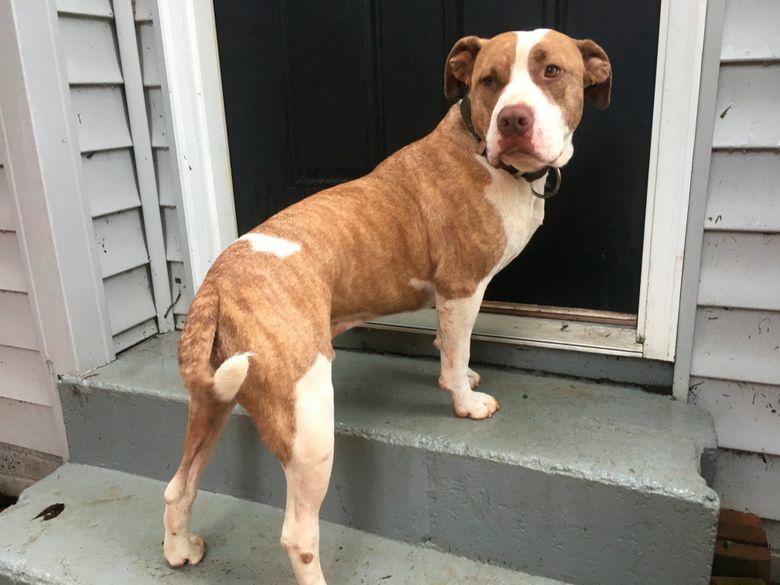 After a year — and dozens of miles — apart, a pit bull named Ratchet was reunited on Friday with his owner, thanks to the dogged determination of another South Carolina dog lover. Esther Atkins was walking her border collie mix, Grace, this week near their Greenville home when they both noticed a sturdy brown and white pup cowering in a mud puddle. After some gentle cajoling, Atkins said that the timid canine followed her home, where she went to work on social media trying to find his owner. After ultimately taking the dog to have him scanned for a tracking microchip, Atkins said that she got in touch with a woman in Greenwood, some 70 miles (113 kilometers) away. It turns out that the 4-year-old, purebred pit bull named Ratchet had been missing for a year — and his owner feared he was dead. According to Ratchet’s owner, a neighbor frustrated that the dog often ended up in his yard told the owners that he’d killed their pup. Atkins arranged a reunion for Friday morning, when Ratchet’s owners drove up to retrieve him, capturing it all on video and chronicling much of the saga online via social media. This isn’t the first time Atkins has played a role in bringing dogs and owners back together. Last year, she said she found a stray husky and ended up finding her owner. And just last week, she helped a neighbor find a dog during one of her regular walks around the neighborhood.